Two years after the Central Government sanctioned Rs 2 crore for the renovation of Bhatner Fort in Hanumangarh, the work is yet to see the light of day. This prompted BJP MP Nihal Chand to question the tall claims of the government. The fort, located on the old Multan-Delhi road, was abandoned after Partition. The old name of Hanumangarh was Bhatner, which means “Fortress of the Bhati”. Believed to be 1,700-year-old, it is considered to be one of the oldest forts of India. It is said the ancient fort situated along the Ghaggar was built in 253 by Bhupat, son of King Bhati of Jaisalmer. After losing the battle against the Sultan of Ghazni, King Bhupat took shelter in the jungle around the Ghaggar. There, he constructed a safe castle for himself, which came to be known as Bhatner. The entire fort is built of bricks, covering 52 bighas. It is in the shape of a parallelogram, with a dozen bastions on each side. Painted Grey Ware and Rang-Mahal Ware are in the wells situated along the wall. In the middle of the 13th century, Sher Shah Suri (Sher Khan), a cousin or nephew of Balban (the Sultan of Delhi), was the Governor in this part of the country. He is said to have carried out repairs of the forts of Bathinda and Bhatner. Sher Khan’s sculpture exists in Bhatner Fort. Sriganganagar BJP MP and former minister Nihal Chand Meghwal said he was nominated as the member of the standing committee on tourism, but only two meetings were held in the past three years. This, he said, spoke volumes of the slack approach towards promoting tourism. 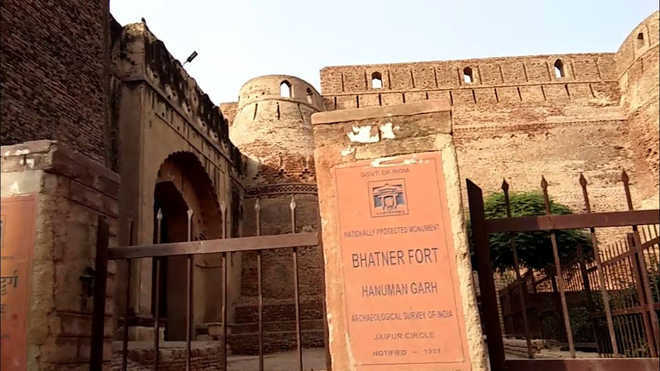 After a long battle by people, the Central Government agreed to sanction Rs 2 crore two years ago for the maintenance of Bhatner Fort in Hanumangarh, but no work has been started to date. The BJP MP said another ancient place Kalibangan (Hanumangarh) was a major provincial capital of the Indus Valley Civilisation. Kalibangan is distinguished by its unique fire altars and “world’s earliest attested ploughed field”. Only Rs 50 lakh was sanctioned after a decade-long persuasion in 2016, but no work started. In 2003, an old skeleton was reportedly stolen from the ancient place, but investigating agencies are still clueless. The MP said efforts needed to be made to develop the museum dedicated to Shaheed Bhagat Singh at Khatkar Kalan.